Fashion is, by definition, dominated by trends. Sometimes they can be defined with broad strokes: “Workwear is back!”; “Why is everybody dressing like a ninja? 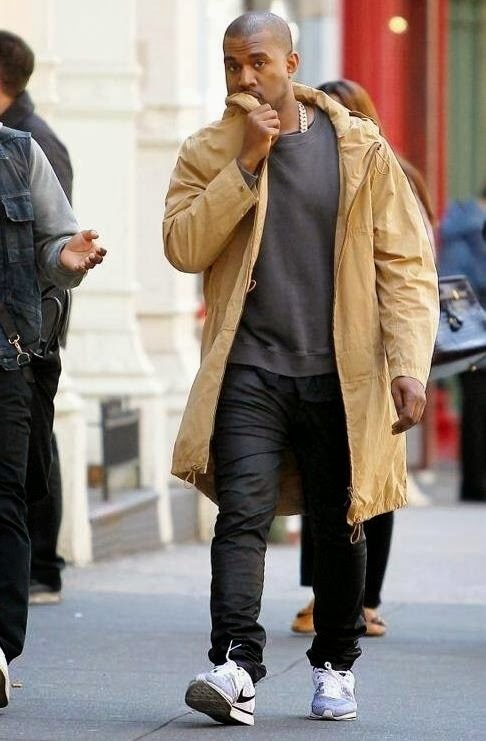 Techwear.”; “Navy blue is the new black.” Those types of trends are usually industry-wide and tend to characterize a shift in the way that people dress in very general terms—macro trends, essentially. But each season, and each macro trend, brings with it a series of much smaller and more niche micro trends that take root within specific segments of men’s fashion or appear as smaller details that accentuate larger aesthetic shifts. Unearthing them usually requires paying attention to the details across myriad brands and collections, with their mere definition as “trends” is often up for debate. But the prevalence of neon green and yellow—perhaps best encapsulated as “volt,” a name popularized by Nike—this season is bucking the trend of micro trends being difficult to identify; even at a cursory glance it’s been impossible to miss. Sportswear in the ’90s, in particular, was flush with neons; Nike’s most popular sneakers from that era carried hits of neon green (Air Max 95), hot pink (Air Max 180) and vibrant blue and yellow (Air Max Plus). Athletes, like Andre Agassi, infused bright colors into traditionally muted sports like tennis and, as cultural historian Very Advanced has pointed out, the ‘90s were punctuated by a neon-loving soccer goalkeeper. Outside of athletics, neons were deeply intertwined with the music (notably and more specifically rave) scenes of the ’90s; a quick search for “’90s windbreakers” brings up a hell of a lot of neon. The confluence of both sportswear and resurgence of ’90s aesthetic influences on designers and streetwear labels alike has set the stage for the emergence of volt as the color du jour—a micro trend emerging from two macro trends. Bearing that in mind, it makes a lot of sense to see hints of neon yellow and green on your Instagram feed, strewn throughout designer runways and in high-end boutiques. Volt is not a new color within contemporary fashion by any means, it has always had a very prominent presence in Nike’s running portfolio, appearing on Flyknits in 2013 (more on that in a second) and as accents on running apparel—the roots for for which are rooted in utilitarianism and safety. But now, it has become an aesthetic statement of sorts. Errolson Hugh has been one of the biggest purveyors of volt gear of late, using bright yellow and green for both his Acronym label and his collaborations with Nike. This season, Hugh caught many off-guard when Acronym released a blinding J66-GTV; it’s true that while some of the brand’s most sought-after pieces are colorful, like the J28-K, many associate Acronym with shades of black, grey and olive. But, if recent history is any indication, that may be changing—at least for the immediate future. Hugh’s collaborations with Nike have, traditionally, featured hints of neon as well: Orange on Air Force 1s, volt on Vapormaxes; volt and hot pink on Prestos. Volt may be fetishized within techwear more than in any other subgenre, which may seem odd at first glance given techwear’s affinity for…well, black. Arc’teryx has a number of pieces that feature volt (though, technically, the brand calls it Lichen), as does Nike’s most recent running collection, while breaking up all black outfits with volt accessories has become something of a thing within the techwear community. But given the sometimes tight relationship between techwear and active lifestyles, it should come as little surprise. Again, the roots of volt and neon in activewear are rooted in safety—and isn’t techwear supposed to embody the ultimate form of utilitarianism? Volt has also seeped into Fall/Winter 2018 runway collections, making it more than just a techwear idiosyncrasy. Craig Green’s collection prominently features patchwork volt green and yellow contrasting against darker shades. Like Hugh and Acronym, Green has a habit of incorporating color into his pieces—often vibrant hues, too. But this Fall/Winter 2018 offering feels decidedly different and his use of neon green and yellow—rather than, say, blue or a more “pure” green colors he normally opts for—doesn’t seem like a coincidence in the grand scheme of things. Instead, he is but one of a handful of high-end designers who have opted to use the hard-to-miss color to craft equally hard-to-miss pieces. At Balenciaga, a brand currently tapped into (and debatably determining) the zeitgeist, neon green and volt yellow feature heavily in its Fall/Winter 2018 collection, from T-shirts, knits and accessories to the brand’s ubiquitous Triple S sneaker. Prada’s revamped Linea Rossa line that debuted this season includes neon green pieces and the brand’s redux of its popular prints also featured flaming (literally) yellows and greens. 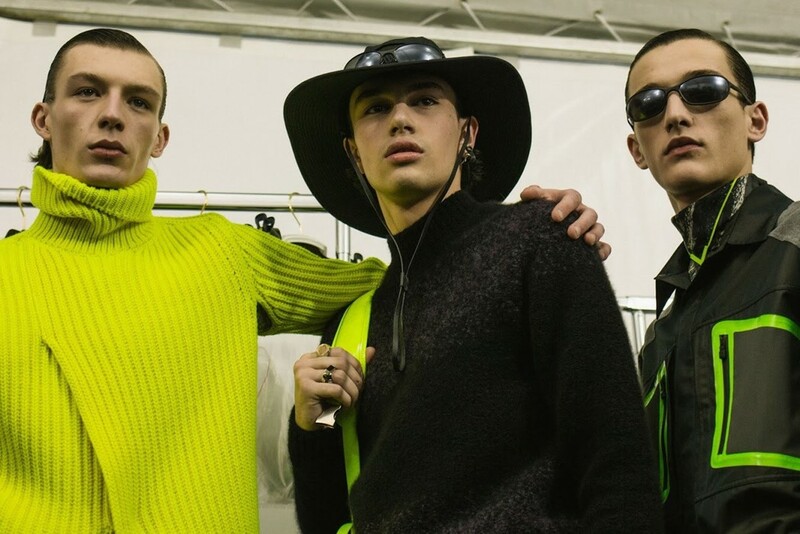 At Louis Vuitton, Kim Jones’ final collection has a few standout volt-infused pieces, but so did Virgil Abloh debut at the house—Spring/Summer 2019— which featured an array of neon yellow, orange and green on clothing and leather accessories alike. Others have found more authentic ways to integrate volt into their work. Junya Watanabe, always one to examine tradition and historical roots, has outfitted a number of his Fall/Winter 2018 pieces with bright reflector stripes, harkening back to volt’s use in workwear (a familiar theme for Watanabe) and sportswear to promote safety. In an era where streetwear and fashion are often one and the same—with the latter borrowing inspiration from both past and present incarnations of the former—a trend wouldn’t be a trend if it was only found among designer labels. That’s what makes volt’s emergence not only impossible to miss, but also impossible to deny. 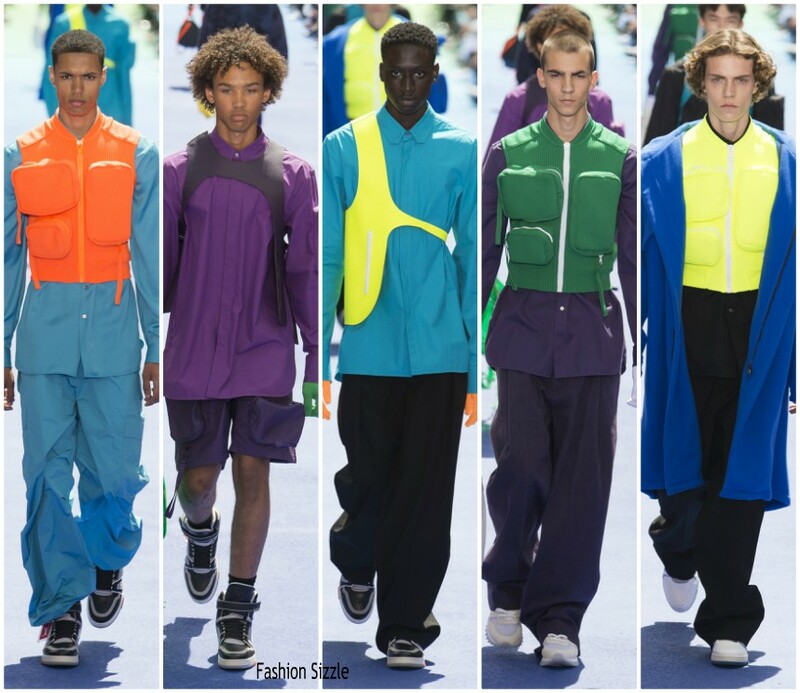 As mentioned earlier, neon hues have long featured in sportswear; but now those pieces, literally designed to be worn for sports, are now being appropriated within fashion and streetwear. The 2013 volt-accented Flyknits were seen as more of a runner’s shoe when they released; it was black-and-white Flyknits that became streetstyle catnip Now, those same 2013 Flyknits are styled with the latest Acronym collection on the brand’s e-commerce platform and the running shoes have become fetishized by the brand’s fans. Nike’s React Element 87, arguably the brand’s greatest lifestyle running shoe since the Flyknit, seems tailormade to showcase the volt trend. For starters, the shoe’s translucent upper lends itself wearing brightly colored socks—which may be a trend of its own judging by the amount of React Element 87s worn with volt-colored socks on one’s Instagram feed. But the shoe’s DNA — at the intersection of hiking, running and techwear — makes bright, vibrant neons a natural fit on the shoe. Take Nike’s collaboration with Undercover on the silhouette; one of the models features a slightly translucent neon yellow upper, while another features a blazing volt midsole. Other shoes which have long sported volt are making the transition, too. adidas has relaunched its iconic Predator soccer shoe, with a cleat and a BOOST-aided lifestyle sneaker. Both feature a blinding volt upper, as do a number of other adidas lifestyle silhouettes, including a new “Frozen Yellow” take on the retro Continental 80 sneaker. Completing the trifecta of streetwear’s preeminent influencers, Supreme’s Fall/Winter 2018 collection features a handful of neon green and yellow pieces, the most noteworthy of which is the lime green Gore-Tex parka. It is a testament to volt’s sweeping popularity across the fashion spectrum. If you need any more proof, a quick scroll through noteworthy Instagram pages and blogs should leave no doubt. @Liljupiterr has become increasingly populated with hits of volt and neon, from the zip-ties on Serena Williams’ Nike x OFF-WHITE sneakers and custom-dyed sneakers to GameBoys and Volkswagens. In other words: Volt is everywhere.